History of the OU » Blog Archive » 50 objects for 50 years. No 26. The Computers and Learning Research Group. 50 objects for 50 years. No 26. The Computers and Learning Research Group. This week’s object is a Group which is marking its 4oth birthday this week. A key activity within The Open University, as in other universities, is the generation of knowledge through research. The OU’s specialist areas include, of course, learning at a distance and open learning. Teaching and learning are central to both these subjects. They’re supported by the use of technology – from television and radio to the Internet and virtual reality. The OU is therefore ideally placed to investigate what new technologies have to offer learners other than novelty value. Learning is accessible for everyone. Teaching is adapted to meet learners’ needs. Learners engage enthusiastically with STEM (science, technology, engineering and maths) learning. The OU Archives contain hundreds of resources generated by the group: abstracts from the annual conferences it has run since its foundation, videos of keynote speeches, research reviews, and research reports. The group currently meets on a Thursday four times a month. First Thursdays are research seminars with a mixture of internal and external speakers. On second Thursdays, the group discusses how best to communicate research – not only to an academic audience but also the wider world through broadcast and social media. The third meeting of the month is an opportunity to share research with each other, and the final meeting offers a chance for general discussion over coffee and cake. CALRG provides an opportunity to make and strengthen connections. Connections between senior and junior staff and research students, connections between departments, and connections between academic and non-academic staff. Where possible, meetings and conferences are recorded or live-streamed, so they can be accessed by regional staff, associate lecturers, and part-time EdD students. 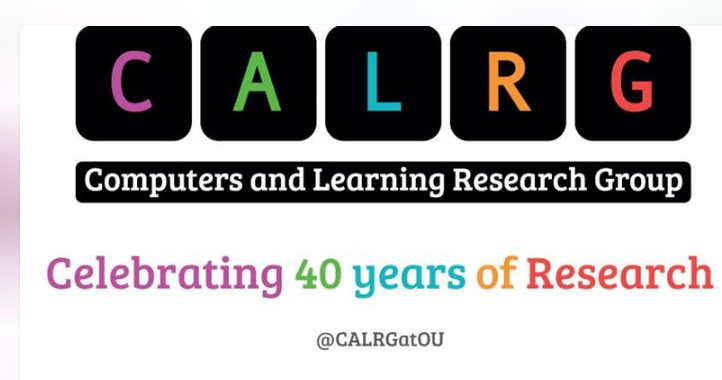 This week, there’s a chance to join CALRG in celebrating 40 years of research. The event on campus in the Berrill lecture theatre is already fully booked. Here, you can sign up to join online on Friday 19 October 9am-5pm. Speakers include CALRG founders Regius Professor Eileen Scanlon and Sir Tim O’Shea, Cambridge emeritus professor Neil Mercer and UCL professor Diana Laurillard, as well as some of the group’s leading current researchers. This posting was contributed by Rebecca Ferguson. If you would like to contribute, get in touch. This entry was posted on Monday, October 15th, 2018 at 2:44 pm by Daniel Weinbren	and is filed under 50 objects, Events, Higher education, History of the OU, Research, Walton Hall campus. You can follow any responses to this entry through the RSS 2.0 feed. You can leave a response, or trackback from your own site.